The Orange County Register offers an editorial honoring the birth of President George Washington. 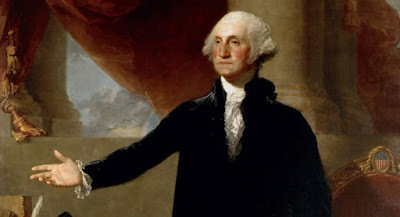 Despite the colloquialization of the holiday to Presidents Day, today officially remains Washington’s Birthday. Thanks to the Uniform Monday Holiday Act, however, the day we honor the father of his country and first president will never actually fall on his birthday, Feb. 22. Perhaps, as a result, the significance of today is likely no more than a footnote on your calendar. But there was a time when Americans stopped everything to honor our first president. There were parades and bunting and, rather than just another Monday off, there was an importance to it all. Thanks for the Washington tribute/link/posting. I remember, however, that he was not always great; consider how he almost single-handedly started the French and Indian War by attacking/murdering the French soldiers and getting his troops badly beaten and humiliated at Fort Necessity in southwestern Pennsylvania. Still, he did learn from his mistakes and become THE essential military leader for the American Revolution. Yeah, he was not always great. He was probably an average child. But he later became, in my view, our greatest military leader an our greatest president. This great republic was shaped in large by Washington's leadership and character.